On June 23, the Australian Institute of Architects will be hosting its annual ACT Architecture Awards night. The best of Canberra’s architectural projects from across residential and commercial will be recognised on the night. Below are three entries from the Residential Architecture (Alterations and Additions) category and one from the Residential Architecture (New). Extra space was the inspiration behind all of the projects. 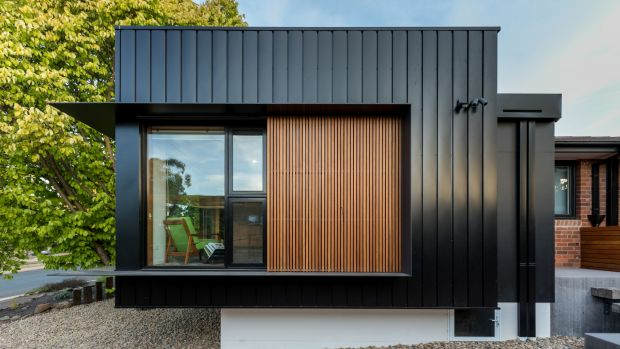 The Aranda House is an addition to an ex-government home in the northside suburb. Whilst an addition, it virtually acts as two separate residences. “The way it works is two families are able to co-inhabit the houses very differently, and essentially enjoy separate gardens and outlooks,” Light House Architecture & Science’s Sarah Lebner says. It’s an example of ‘Density by Stealth’. “Density by Stealth is the idea there’s a missing middle in most of our cities of good quality medium-density housing, and that’s largely restricted due to regularities around planning rules as well as how you structure that financially and legally,” Sarah says. Flexibility and functionality was important for the design of the home. Every section of the 152.5 square metres of home is utilised, with small kids’ bedrooms, a rumpus room that doubles as a bedroom and a farmhouse-style kitchen where it wraps around a dining table. The Aranda House has an EER of eight, meaning it uses around 55 per cent less energy in heating and cooling than a standard six-star home. Indeed, sustainability is a core part of Light House Architecture & Science, where architects and building scientists work together in designing homes. “It means we are working collaboratively between modelling and testing the science side of the house, as well as developing the design, right from the get-go we are looking at optimising window locations so that we can make the house energy efficient in the most affordable and practical way,” adds Sarah. Inspired by the tradition of a British conservatory, the Curtin Conservatory is a glazed light-filled addition to a modest three-bedroom Curtin home. “The Brits have adapted to their cold and rainy climate by putting a room in the back garden that’s full of light and engaged with the garden,” says Judd Studio’s Nathan Judd. The home is influenced by an art-deco design and took around nine months to design. The clients were an older couple who downsized but still wanted space for family celebrations. Judd Studio is a boutique practice operating in Braddon. “It’s nice to do something a bit sculptural, we like to do work that has a sense of volume or material that’s a pleasure to live in,” adds Nathan. It was the need for more space and flexibility for a growing family that necessitated the need for the addition of a new wing to a home in Curtin, and resulted in the DB House – a hovering living room pod that appears to partly float behind a mature Elm tree. A collaboration between Ben Walker Architects (BWA) and PELLE Architects, DB House utilises cubic shapes for the new wings instead of the traditional pitched roof, part of a desire from the clients to visually mark the new elements as different to the original house in terms of character. 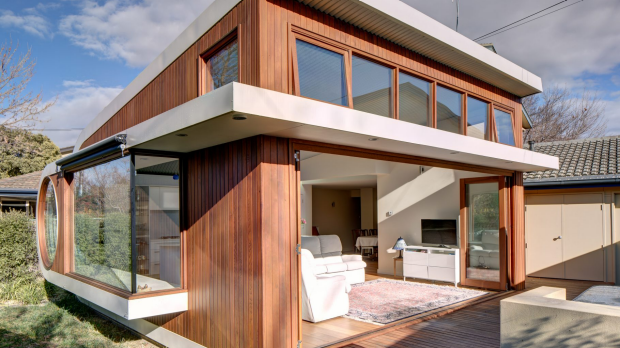 Alongside the addition, upgrades were also undertaken to some existing interiors with improvements to the thermal and acoustic performance of the home. “The clients have an excellent understanding of sustainable design principles and theory and wanted that to be an integral part of the project brief,” says BWA director Ben Walker. Both BWA and PELLE Architects specialise in residential and small-scale commercial projects. 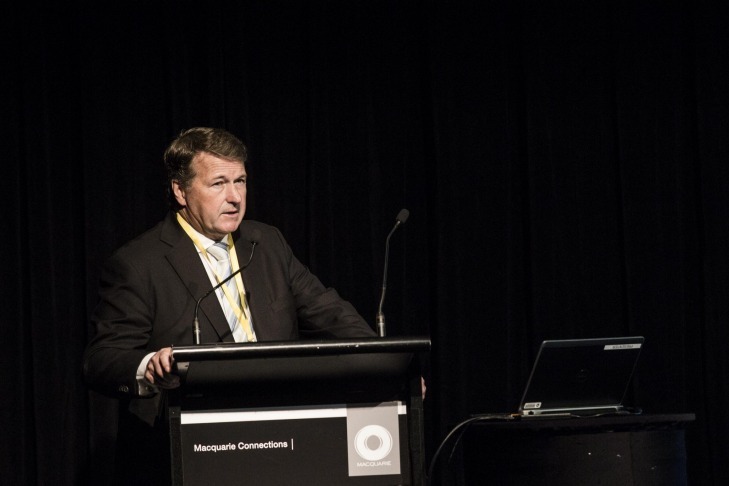 “I find Canberra a very interesting place to work in as the city undertakes generation and densification,” adds Ben. Collins Caddaye architects had a free when it came to designing the Swan House. The clients were after a secondary dwelling they could live in, with their existing home to be retained for guests. It is the only entry in this article falling under the Residential Architecture (New) category. 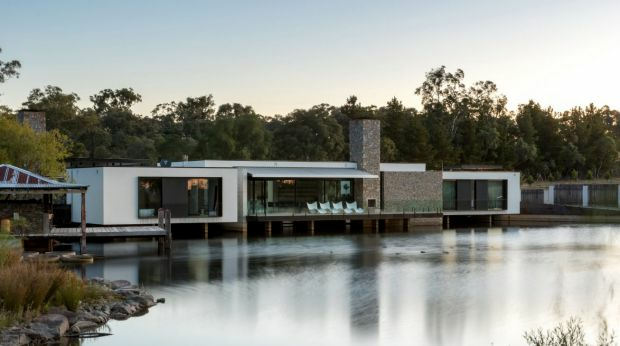 Located in Fernleigh Park, just outside of Googong, the Swan House is a unique home bridging a body of water. Lead architect, Andrew Collins, happened to stumble across the dam when inspecting the site and that led to his inspiration. The home took longer than normal, with Andrew starting the project in 2012. “Ordinarily, it wouldn’t take so long but this one was slightly different in that the construction methodology strategy was integral to the design,” he said. 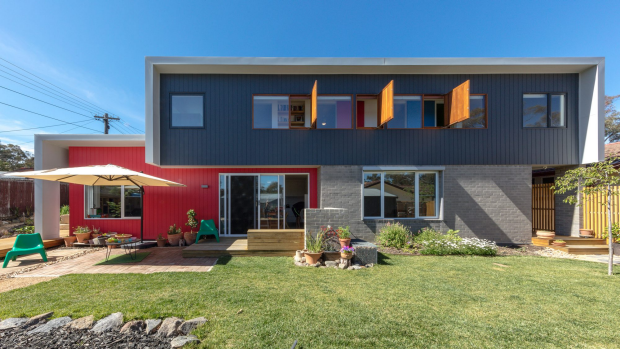 The hard work has paid off, with the home shortlisted for a national award. Andrew’s father started Collins Caddeye more than 30 years ago. Andrew says “we’re in it for the joy of architecture”. “It doesn’t matter what the project is, as long as it is interesting because that is the joy of architecture,” he adds.